When you have the president, the ambassador and the police chief among the speakers at your retirement reception, there should be no doubt that you’re important to the university. 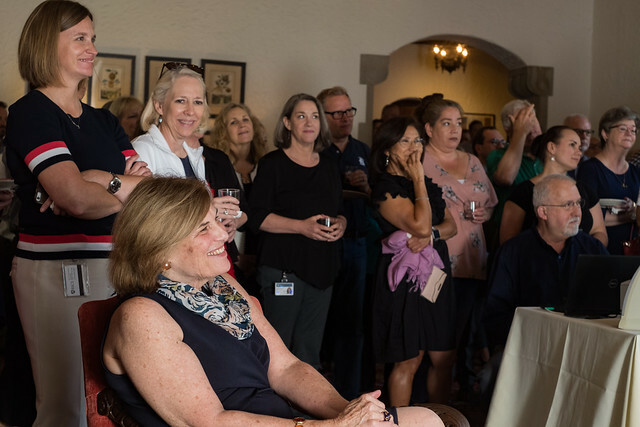 Members of the Rice community who gathered in the lounge of Cohen House May 18 assured Associate Vice President for Human Resources Mary Cronin not only that she’s important, but also respected, appreciated and loved. Cronin, who came to Rice in 2001, will retire June 30. Cronin and her Human Resources team have achieved a number of successes over the years. Rice was named one of Houston’s best places to work nine years in a row by the Houston Business Journal. Under Cronin’s leadership, HR implemented professional development courses for staff, leadership training for mid-level managers, staff appreciation events, service anniversary recognition for employees and town hall meetings with the president. Cronin was instrumental in the opening of the Rice Children’s Campus — the university’s first early learning facility for children of Rice faculty, staff and students. HR has coordinated the yearly benefits options for employees and assisted with recruitment and hiring of thousands of staff and faculty members. In the aftermath of hurricanes Ike and Harvey, HR set policy for accommodating employees who were unable to come to work and also arranged for on-campus day care when local school districts remained closed because of the flooding caused by Harvey. This year HR is launching Careers at Rice — a restructuring of job classifications and pay scale to help retain employees and encourage them to seek career advancement “here at the institute” — one of Cronin’s favorite phrases. Kirby said Cronin often used that phrase in reference to Rice’s first 50 years, when the school was known as the William M. Rice Institute for the Advancement of Literature, Science and Art. “This was Mary’s way of both reminding us who we are and where we’ve come from and what makes Rice special while simultaneously delivering a kick in the pants,” he said. Ambassador Edward Djerejian, director of Rice’s Baker Institute for Public Policy, mentioned that the author of the 1937 novel “The Citadel” is Archibald (A.J.) Cronin, but his last name is not the only connection to Mary Cronin. “A citadel is a fortress protecting or dominating the city — in our case, a campus,” Djerejian said. “Mary has protected us and dominated us,” he added, commending her “astute, perspicacious insights, judgments and recommendations on a myriad of human resources challenges.” He thanked her for the critical communication she has provided not just to the Baker Institute but across campus. “We are indeed losing a great significant asset,” he said. Ryan Kirksey, senior assistant to the president, read a message from President David Leebron, who expressed regrets about not being able to attend, due to unanticipated but necessary international travel. Rene Salinas-Schmidt, executive administrative assistant for project management and engineering in Facilities Engineering and Planning, said the Staff Advisory Committee that he co-chairs and staff across the university “can’t thank you enough for all that you’ve done on our behalf. You go above and beyond the RICE MILE” — a reference to an award given to exceptional staff members who exhibit eight core values: responsibility, integrity, community, excellence, mission-driven, impact, leadership and entrepreneurial spirit. Salinas then presented Cronin with a RICE MILE Award from the Staff Advisory Committee, which generated “Oh, wow!” and “Oh, boy!” repeatedly from Cronin. Current and former HR staff members expressed their thanks and congratulations to Cronin via video. In honor of Cronin’s love of poetry, many of them crafted limericks and poems in which they lauded their boss’s mentorship, tenacity, integrity, sense of humor, friendship and kindness. The video ended with a plea for Cronin to recite a poem about February that she has performed at various gatherings with the HR team. Cronin proceeded to recite from memory one of her favorite poems, “I’m Not Just February,” which she wrote in the third grade at St. Joseph School in Wakefield, Mass. “I am doing this under duress,” she joked, adding that until this moment, the largest group she had performed the poem for was her third-grade class. As it turned out, “I’m Not Just February” was not just the only poem Cronin recited at the retirement reception. For this special occasion, she wrote an untitled poem in which she reminisced and shared her wisdom. Is your own career isn’t really your own. It’s a symphony of all who’ve helped you along. Continuing in verse, Cronin managed to name colleagues, her staff and other employees she’s worked with throughout her Rice career. “… So floored by your constant commitment to Rice. It’s ever our treasure, our pearl of great price,” she said.